From L to R: Jonathan Martindale, Executive Director, Phoenix Natural Gas, Conall McGinn as Tin Man, Holly Topping as Dorothy, Alex Jemphrey as Cowardly Lion, Caroline McMichael as Dorothy, Peter Gildernew as Scarecrow and �ine Dolan, Creative Learning Manager and Associate Producer of the Grand Opera House Youth Production. 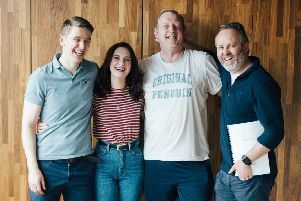 An all singing, all dancing musical spectacular, The Wizard of Oz stars some of Northern Ireland’s most talented 10-18 year olds, who have spent the past two weeks working with a professional creative team to bring this incredible production to life. 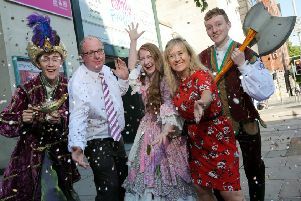 Aine Dolan, Creative Learning Manager of the Grand Opera House said; “The opening night of the Summer Youth Production was a huge success and there is a real buzz in the Grand Opera House as everyone looks forward to the rest of the show’s run. At the heart of the Summer Youth Production is a truly talented local cast, with the role of Dorothy shared by Newtownabbey’s Holly Topping and Caroline Michael from Jordanstown. Dorothy’s three companions on the yellow brick road are the Lion, played by Belfast’s Alex Jemphrey, the Scarecrow, played by Peter Gildernew of Aughnacloy, and the Tin Man, performed by Conall McGinn from Belfast. If you would like to follow the yellow brick road to the Grand Opera House to see this year’s Summer Youth Production of The Wizard of Oz, tickets to the remaining shows on Friday 27 – Sunday July 29 can be purchased by visiting goh.co.uk or by contacting Box Office on 028 9024 1919.